I have tried explaining this saying to my students, but they do not understand the concepts. The above saying is one that I try to instill in my students. Whether it be a work of literature, an idea, or the mechanics of writing, I try to give my students the skills and information that they will have for life, so it is useful to them long after they leave my class. I always tell my students, “I do not know everything (although many students think teachers should know everything), but if you have a question that I cannot answer, I usually know someone who can answer it or I can tell you how to go about getting an answer.” I am always happy when I can learn something new from one of my student’s assignments. In addition to performances, I remember Dr. B’s masterclasses might include waltzing to music to be able to understand the characteristics of the waltz; watching slides of Vienna or Salzburg when discussing Mozart; viewing Hungarian artifacts and pictures when discussing Bartókian folk melodies, or visiting a harpsichord maker when discussing Bach. Dr. B. sparked her students’ interests to search and investigate other fields besides music; for example, languages and literature, sports, art. She kept her students informed and up-to-date on upcoming lectures, recitals, and she always reminded her students to “scan for information on signs and posters” so you would know what events were coming up. A piano lesson with Dr. B. might include “playing” a piece of music on top of the lid of the piano, and she could still tell if your tone would be correct or if you were playing wrong notes. - “Don’t use your fingers to play piano – use your whole arm for weight; use a full bow for phrasing, like a cellist. Using the fingers to lead the arm is like letting the train be led by (a scooter). A piano lesson with Dr. B. might also include lying down on the floor when discussing the Alexander Technique and methods of relaxation, or standing with your back and heals against the door and bending your knees to help keep your back straight when sitting at the piano. If you were not able to get through everything on your lesson, or if Dr. B. wanted to hear something later in the week, she would often say, “Come in on Wednesday for a ‘quickie’.” I used to laugh when she said this. Many times I would go into her studio for a ‘quickie’ or ‘mini-lesson’ and there would be four or five others in her studio (especially around jury time), so you usually had an audience. Dr. B. was one teacher who was not concerned about her students playing big works. Having only played pieces at the Grade VIII, IX and X levels, Dr. B. made it clear that it was better to play a simple piece well than to play a difficult piece badly. One should never be ashamed of how easy a piece may seem. Sometimes the easiest sounding pieces can be very difficult. I remember several parties that Dr. B. held at her apartment, and she encouraged people to always bring friends. We would enjoy sitting around Dr. B.’s living room and being almost enchanted with the surroundings and mesmerized by the stories from Dr. B.’s childhood, youth, and experiences in Europe, the United States and her early days in Canada; from the time of her understanding the punch-line of a joke during a Mozart Adagio (that a janitor told her) to her experiences of her first square dance on St. Louis to coming to Canada (London) and being met at the train station by the lady with all of the children. Dr. B. always had many stories to share at parties. 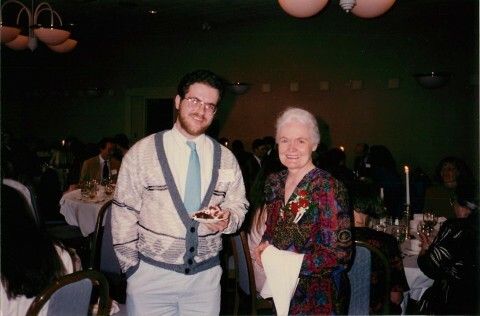 In looking back over the two years that I studied with Dr. B., I can say that many of the things that she told us did not “sink in” until after I no longer studied with her. I have a lot of memories of master classes, lessons, sayings and celebrations. Many of these things will always be with me, and I try to pass on to others these “words of wisdom” that I discovered during my first two years at Western. On further comment, Dr. B. used to say, “Life is not easy…People can be mean and you have to be prepared for this, so you can handle your responsibilities.” I often tell my students this also – but many do not understand. I hope one day these words will sink in.